Hydrozell puder, 120 gram, för underarbete, ofärgad, 120 gram blir 780 cm3. Scenic modelling knifing filler, light-weight material for the design of rock structures, transparent. 120 g filler powder for 780 cm³ knifing filler. 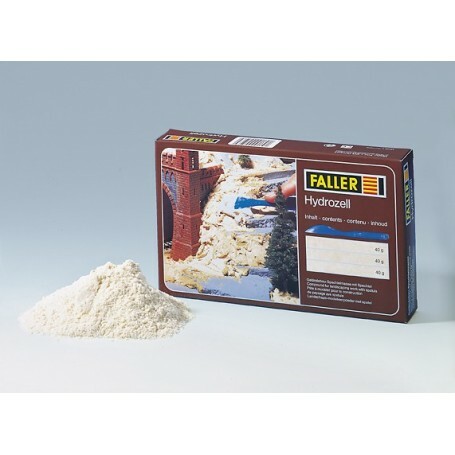 Hydrozell is a self-adhesive landscape construction material for lifelike modelling various landscape components and the realistic addition of house- and building models, tunnel portals and bridges to the model landscape. Landscape components in Hydrozell are super light yet very sturdy. Hydrozell is mixed with water for a dough-like paste. Mixed with approx. 0.5 l water the contents will make filler compound for approx. 780 ccm (3/4 l), which is more than 3/4 of the volume of this package. The compound remains in a workable state for approx. 8 hours and is fully cured after approx. 24 hours. The undyed neutral filler compound can be modified with emulsion paint.